I am so excited to be able to post about this book. Kat Coyle approached me a little over a year ago to see if I'd like to contribute to her upcoming book. I received my copy last week and wanted to wait until she posted before I did so. The cover alone will probably sell you. 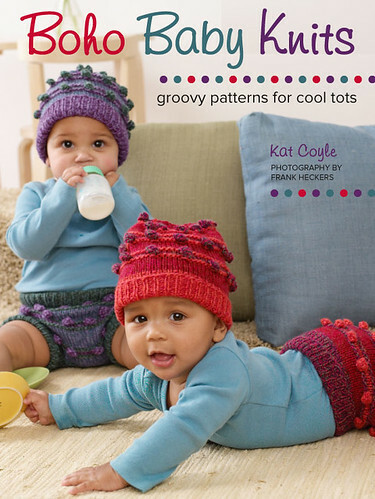 The patterns in this book run the gamut from simple to complex, but each is original, fun, and worked in gorgeous yarns. I think I speak for everyone who contributed when I say that Kat is absolutely fantastic to work with. She has great vision, an impeccable eye for color, and her years of designing makes her keenly aware of what a designer needs to do their job successfully. I'm so proud to be a part of this book. This is my pattern, The Poet Coat. It's worked in two shades of Blue Sky Alpaca and adorned with gold star buttons and a zipper pull. The main pattern is a linen stitch which produces a really dense fabric without much bulk. The model is simply too cute for words. My friends, Mary-Heather Coger, Julia Trice and Edna Hart, also contributed patterns, as well as Beth Abaravich, whom I never got to know but whose work is absolutely brilliant. 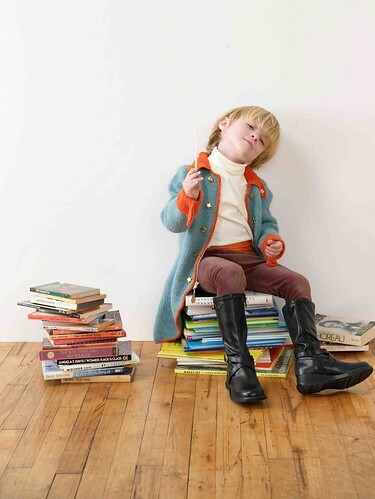 This page is an archive of recent entries in the poet coat category. hiking is the previous category. ocean is the next category.